Jim is a professional speaker and consultant who works with sales teams to increase sales using mental toughness psychological performance training. That truly is a mouth full but it is actually a perfect fit for training and racing in the triathlon world. It is the connection between the physical fortitude required and the psychological component of endurance sports helps him consistently perform in every triathlon event he enters. He never thought of himself as an endurance athlete and quickly learned to love everything the sport represents. Jim completed his 1st Ironman® in 2012 (IMFL) and 2nd in 2014 (IMCHOO) with a few 70.3’s, marathons, half marathons and 10K’s sprinkled throughout the years. 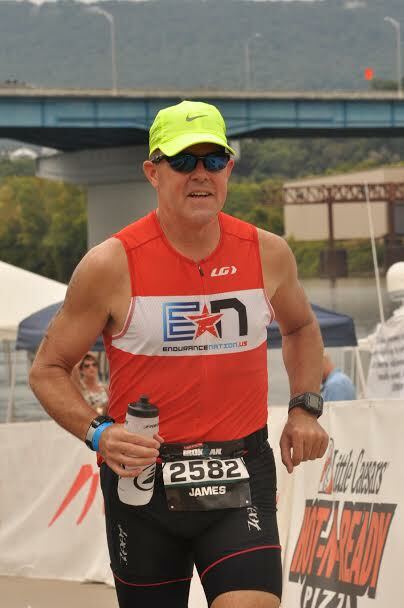 Jim joined Endurance Nation during the 2014 membership drive after an exhaustive search for a triathlon community that not only had a track record of success, tried and true customized training plans and a world wide footprint but reduced the “noise” that is so prevalent in most online forums. He got tired of the “more is better” message that seemed to be most Age Grouper montra. The EN coaches know how to prepare you for your Ironman event. Married to my best friend and biggest supporter, Cathy, for 25 years. Connect with Jim on Twitter @JimHoganConsult. Proudest Triathlon Accomplishment – Ironman Chattanooga (144.8), 12:05:02 because of the challenging course.